Long Island Spine Specialists is donating surgical and administrative expertise in Ethiopia and Costa Rica to help children in need. 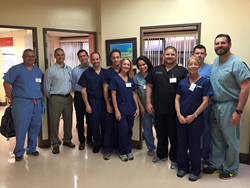 Members of Long Island Spine Specialists in Costa Rica on their recent mission trip. We are proud of the physicians and medical providers who give of their own time, money, and expertise to help children who do not have access to the kind of quality medical care we have in the United States. Back Pain Centers of America (BPC), which connects people searching for solutions to their neck and back pain to find a reputable physician in their area, announces that their network member spine care provider, Long Island Spine Specialists is donating surgical and administrative expertise in Ethiopia and Costa Rica to help children in need. Back Pain Centers of America is supporting the effort by making a financial donation in support of the Long Island Spine effort via Spine Hope, a 501 (c) (3) nonprofit organization dedicated to bringing advanced spinal treatments directly to underprivileged children around the world. Long Island Spine Specialists’ executive director, Mae Caime, R.N., is returning to Ethiopia in mid-May representing non-profit organization Spine Hope for evaluation of hospitals where they can perform scoliosis surgeries to a large number of children. Caime will be caring for children on this mission and also helping to establish a hospital to service more children over time in a quality healthcare setting. The Long Island-based medical practice has supported three medical mission trips providing medical care to impoverished children of Ethiopia. In February, Laurence E. Mermelstein, M.D. and Kristopher Stillwell, PA-C as a part of Spine Hope went to Costa Rica to perform life-changing scoliosis surgeries to children with no access to this advanced medical care. Back Pain Centers of America has helped people find safe, reliable relief for chronic pain since 2009. The call centers match patients searching for relief for neck and back pain to reputable, board-certified healthcare practices in their geographic area. They have the largest network of minimally-invasive spine centers in America. This service is free to patients. For more information for patients, please visit http://www.backpaincenters.com. For spine practices interested in joining the network, please visit http://www.backpaincentersofamerica.com. Also follow BPC on LinkedIn, Facebook, or Twitter.